Although forming in Manchester, England, in 1965 under the banner of New Religion, Stack Waddy first came to attention at the 1969 Progressive Blues Festival in Buxton with their boisterous brand of British ’60s-styled R&B. 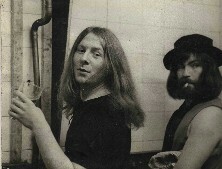 Signing with John Peel’s Dandelion label, they released the single “Roadrunner” in 1970, followed by their self-titled debut album in 1971. Led by singer John Knail, they developed a reputation as an excellent live act, despite Knail’s habit of throwing bottles or assaulting crowds who were not appreciative of their efforts. Another single, “You Really Got Me,” followed in 1972, as did their second album, Bugger Off, a title which saw it banned by several shops.